Baingan Bartha is a spicy vegetarian curry made from Eggplant. Eggplant is baked/cooked on direct flame to impart a smoky flavour to it and the same is cooked with other spices and vegetables. It really is a great side dish to Rotis. I got this recipe from my friend Jahnavi. 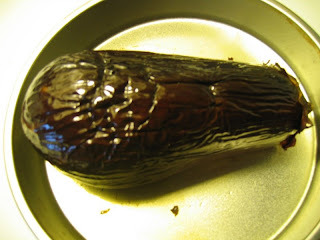 Apply a spoon of olive oil on the egg plant all over, poke some holes using fork and bake it in 350' for about 30-40 minutes or till done. Peel the skin off from the eggplant. Mash it or chop it coarse depending on how you want to feel the eggplant. Set aside. In 2 spoons of ghee/oil, splutter cumin,saunf, add chopped onions and saute till pink. Add tomato and cook till done. Add tumeric , Garam masala powder, Cumin Coriander powder, Red chilli powder and salt, top it with a table spoon of curd and give a good mix. Add mashed or coarsely chopped egg plant and cover cook for couple of minutes till the flavour blends. Garnish with coriander/cilantro. A spoon of lime juice is optional.Serve hot with Rotis. wow! It has turned out soooo good! reminds me of my sister's! looks yumm..love it..though i make it very rarely..
looks sooo yummm dear...lovely color.. thanks for sharing!! 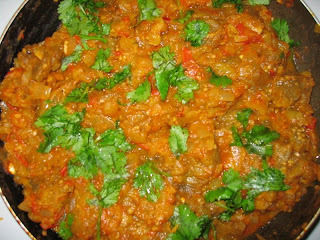 Baingan burtha looks so yum..very tempting curry..
Looks so delicious! my fav comfort food!